Although it is some time since I have posted to this site, it’s for good reason. My current employer recently decided that my role, and that of several colleagues should be made redundant. Fortunately I saw the writing on the wall some time before the axe fell, and even then it was with a bit of notice so I have had time to start planning the next phase of my career. It’s not even Plan B. It’s a positive diversion to the next adventure in my working life. This period of employment for a Utility company has just spanned seven years and I am grateful for that period of financial stability. It came at a time when I desperately needed it and of course I have learnt a lot along the way. I now know a lot more about power generation than I did seven years ago. Increasingly though, my tolerance for corporate bureaucracy is decreasing and so the rising operational restrictions and containment of my working day are becoming more difficult to tolerate. I’m jumping back into self-employment. Woo Hoo. I won’t pretend that I don’t have moments of scaring myself silly, because I do. Here I am launc hing into a new business which will have to start generating income relatively quickly. That won’t be the same as I am currently receiving but it still needs to provide some income. I face a precarious retirements in coming years if I don’t make a success of this. What I’ve been doing is planning, and learning, and thinking, and studying, and talking to anyone who would listen and brainstorming and planning again. I have come up with my business concept, which is fluid at this stage in recognition of the fact that it will evolve during the early days. You have no idea how difficult it is these days to come up with a name that is relevant, that feels right, that is registerable and has available .com and .com.au domain names. I reviewed and tested over a hundred options. Then came the logo. I knew more definitively what I didn’t want but was hazy on what I did want. I commissioned several people via Fiverr to come up with a design, and they each produced cookie-cutter type designs that did not resonate at all. There was one that had elements that I liked and so I took it and developed it a bit further and then got a local graphic designer to add the finishing touches. That process took quite a few weeks as well. I have completed my business plan, and incorporated within that my 90-day plan to keep me on track. I am now working on my website which I hope to have in a launch-able state by 1 August. This timing is influenced a bit by the fact that my current paid employment terminates on 31 July. I’ll be making a transition from one to the other. I still have to design and create the reference material that I need to support the business but that’s on August’s To Do list. August will be very busy because I am also attending the annual conference of the Romance Writers of Australia, to be held in Melbourne. Although my first novel was published, that publisher went out of business and rights reverted to me. I will take the opportunity to pitch the novel to other publishers at the conference. I have also been working on the second novel, which is a sequel to the first. A chance remark about conflict between characters made me think of an additional thread that would run through the first novel and carry over in the second, not only tying them more strongly together but strengthening the plot line of the first. I have a bit of work to do therefore in modifying ‘The Red Heart’ before the pitch. Attending the conference is a huge expense, but it is also my treat to myself after all the stress and angst that has been taking place at work for many months now. I’m looking forward to it. I’ll post further details of the new business when I’m ready to launch. Hopefully I’ll also be able to report that a new publisher has taken up my book. If that doesn’t happen, I will consider self-publishing. With the beginning of this financial year (July 2014) I have dropped back from five to four days in my paid job. Friday was my day of choice to spend at home, but if there is something crucial that comes up at work, I have indicated that I am prepared to vary the day off. My colleagues have assumed that this is the first step towards retirement as I am the oldest by far in my section and indeed one of the oldest women in the company. Work it seems is the domain of the 40-year old. They are right in that I am desperate to ‘retire’ from this soulless and patronising environment. I hadn’t appreciated when I was 35-40 that this was as good as it got. At that age I was at my peak as far as workplace relevance goes and since then the opportunities that have been open to me have decreased, with the general assumption that a younger person will be sharper, more edgy, more hungry, and more deserving. I suspect it is a little different for men of a similar age – they have a longer use-by date but even they report after a while that they start to be sidelined as well. This is in fact the first step towards the rest of my life, which is going to be more satisfying, more challenging and more rewarding. I am working towards self-employment and so am doing some study, am honing my writing skills and repertoire, am using the time for lots of research and am planning future travels. The diminished income is a bit of a fright but I have done my sums and I know that I can manage. It also makes the week much more tolerable as well and by Thursday I am positively delighted, knowing that the next day will be all mine. 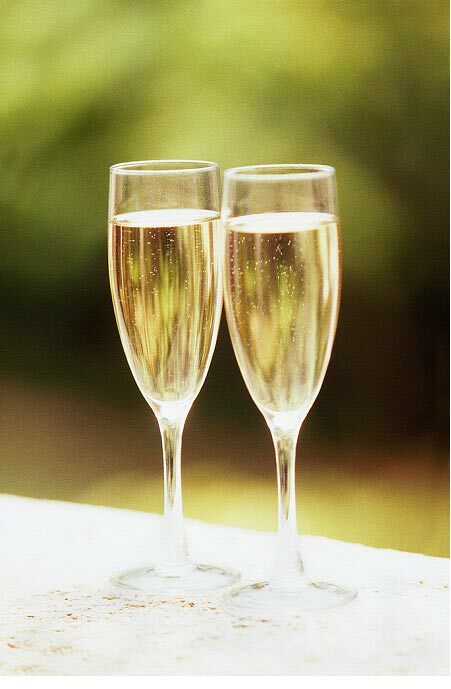 Today -yay it’s Friday – is part work and part pleasure. To start with I am setting up a separate blog for my author identity. I have recently published a novel under the pseudonym of Emily Hussey (more of that in another post) and have been most remiss in not establishing the relevant blog. Looking around my office, there is a bit of filing and sorting that needs to be done as well. Then will come the haircut in a new salon that I am trialling and late afternoon I will join a group of friends for afternoon tea that will incorporate champers and chocolate and a discussion on my novel. This will be at the home of a 95 year old who is a wonderful woman. She has such a questing mind and is so supportive or my writing and all endeavours really. If you can get her talking about her life, she has had some fascinating experiences as well, and looking at the paintings and items around her home gives some indication of the journey that she has travelled. We all appreciate the pleasures of these rare afternoons, very conscious that with Lorna’s age and declining health, there will not be so many of them. When I think of my day, why would I be doing anything else? What do you do with your Fridays? There has to be some sort of reward for surviving a week of above 40 degree temperatures here in Adelaide, and today it was attending a travel writing workshop. I don’t necessarily see myself taking up a new travel writing career (it pays too poorly for a start) but as always I have come away from the day impassioned and full of ideas for different writing projects. The last workshop that I did was writing for radio and that was enthusiasm-generating as well. Oh for the time to do it all. Those brain storms and possibilities are all documented and at some point I will return to them and follow some up. Not that I haven’t been writing. My manuscript ‘The Red Heart’ is with the publisher and supposedly is undergoing an editing process as we write and the cover is also being designed. The release date was 14 February but that date is drawing alarmingly close and I haven’t had confirmation that it will actually be made available on that date. Hopefully soon. In the meantime, I need to do some more work on the sequel. I have the general plot idea but as I am just working on the first chapter there is much to be done. I have a short story to submit to an anthology as well. The publisher is seeking submissions on love stories, and I have just the thing in my bottom drawer, written about some of my observations from my occasional work as a marriage celebrant. It will need some minor adaptation to suit the submission guidelines but other than that it is ready to go. Time is one of the most precious commodities in my life, and I have come to the decision that in the middle of the year, I will reduce my working days to four per week. This will of course mean a reduction in income but in part I will be pulling the belt tighter and in part will be developing alternative sources. I have started a program of study that will be the springboard for the next career change – one that will ultimately allow me to be self-employed again. More on that later. In the meantime, young Donald and I are travelling to Japan in a couple of months and this will be an ideal time to put some travel writing ideas into practice. We are going to attend the wedding of a young friend and are very much looking forward to the cultural experience – as well as the food, the sights, and the adventure. I will be writing about it here of course, but will think about other avenues in the coming weeks. It will be such an antidote to recent drab working experiences – I can hardly wait. “How long had you known him?” That is sometimes a question that I am asked after I have delivered a eulogy. In most cases I have not had the pleasure of meeting the deceased. What I have done is listened carefully to his nearest and dearest as they relate to me their memories and experiences. They laugh and they cry and relate the various anecdotes – and I listen. Bit by bit, the picture grows. What was his background? Did he have a sense of humour? What was his philosophy on life? In this way, I interpret the essence of the man in eulogy form. This is part of my role as a funeral celebrant. Sometimes I do know the dearly departed, and that is why I have been asked to officiate at the ceremony. Those eulogies are all the more poignant as I draw on my own memories, reflecting both my experiences and those of friends and relatives. Doing a life justice is a bitter-sweet experience, but one that is so satisfying when you know you have done it well. There are challenges of course. How do you write a eulogy for a child who has been snatched so young? What about the loner about whom nobody knew very much? Sadly there are those difficult characters, who have left a raft of bitterness and bad memories behind. There is a story behind each of those people and the challenge is in discovering it and delivering a eulogy that meets the needs of those in attendance. These are some of the scenarios that we will discuss in our coming workshop – how to listen, what to ask, how to divine, how to write and lastly how to deliver a eulogy that leaves the mourners feeling that they have both learnt something new, and been reminded of what they knew and loved about the deceased. They will listen, they will laugh, they will cry and they will remember. At some point, you may be called upon to write or contribute to a eulogy. Often this will be with very little notice and in a time of much emotion and distress. This is a time to call on interview techniques, interpersonal and writing skills. On Sunday 21st July, I am delivering a workshop on writing eulogies at the SA Writer’s Centre. Details are available from the Centre. In this workshop, you will learn the techniques to deliver a eulogy that will inform, delight, transfix and celebrate. You will engagingly encapsulate the lifespan of a person with your words and capture the essence of the deceased. 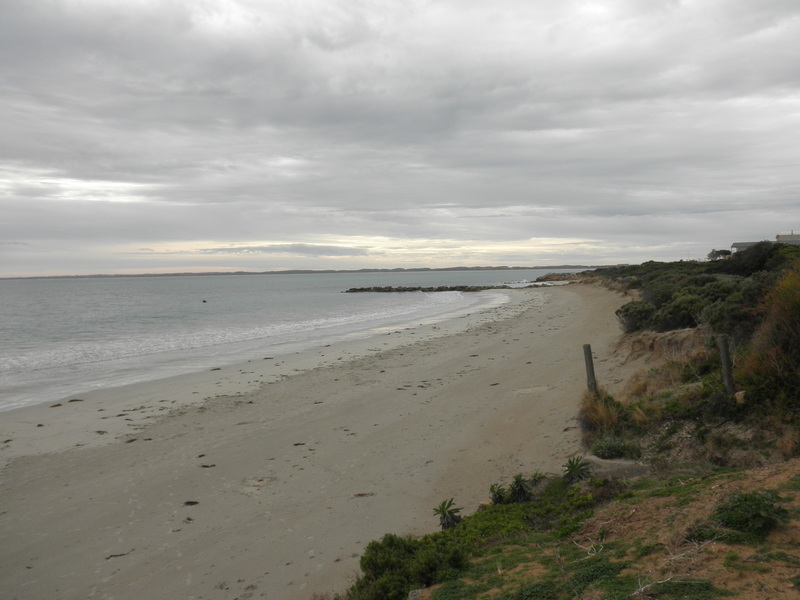 One of my favourite places is Robe, in the south east of South Australia. It is a historic coastal village that is known these days for its lobster catches, most of which are destined for foreign tables, unfortunately. At the end of the week I will be travelling to Port Fairy in Victoria for an annual sojourn with friends and on a whim I have taken the entire week off work, and have been spending the preceding days in Robe. Here I have been writing, and walking and thinking and meandering. Tonight, in honour of my impending birthday, which is one of those with a zero on the end, I am taking myself to a highly recommended seafood restaurant, and dining on lobster. This is an extravagant indulgence but this birthday won’t come around again and I think I deserve it. Robe is approximately four hours’ drive south of Adelaide. When making long journeys by car, I borrow a couple of talking books from the library. Listening to the story makes the time pass more easily. Baz Luhrman’s film ‘The Great Gatsby’ is about to be released and before seeing it I would like to re-acquaint myself with the book. It would be great, I thought, if I could find a digital copy of the book at the library so that I would listen to it in the car. It seemed such a positive omen for this trip therefore when there on the shelf and right in front of me was a copy of Gatsby. It was meant to be. I listened to most of it on the way down and was captivated by the elegance of Scott F Fitzgerald’s writing. It is something to aspire to. I am staying in a motel, which is a little uninspiring, but is one of the cheaper options in town. Of course I am paying the rate that applies to two people but that is what happens when you travel on your own. In between discovering where the best coffee in town is brewed, I have also been working on a short story which I started some years ago and at that time, reached a dead end. I have circumnavigated that block and finished the tale, in draft form at least. That feels good. I have also revisited a novel, based in Robe and which I started a decade ago. Reading now what I wrote then, I realise how laboriously written it was and how much needs to be deleted. The story itself, not totally plotted, has merit but the telling needs much work. At least I have developed skill to the point where I recognise bad writing when I see it, especially my own. I will pick this story up again and try to do something with it. The weather is too cold for swimming in the sea, or even paddling. Great for bracing walks along the beach though. This is the view from the Town Beach. This afternoon, having finished the draft of my story, I wandered along Long Beach instead (yes, that is what it is called). The tide was going out and I cannot resist looking for treasures that the sea might have yielded, like a perfectly formed fan shell. 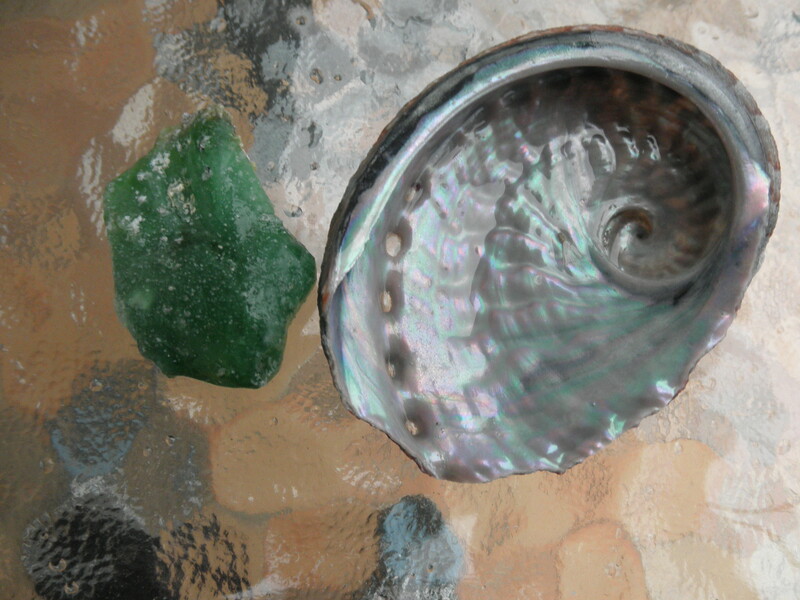 There weren’t any but I found a shell with iridescent nacre and also a bit of wave-buffeted and encrusted green glass. In a previous post on Slow Writing, I mentioned my intention to acquire a fountain pen again and to write; write letters, write in my journal (as opposed to my blog) and to write those more intimate communications. I brought the pen with me and yesterday, sat in the window of the local library, overlooking the foreshore and brought my journal up-to-date. Sigh. Why would I ever go back to work??? Time to get ready for my dinner. Along with the jeans and woollen jumpers, I packed an outfit suitable for fine dining. I shall wash and dry my hair, pull on my stockings and apply my most sophisticated face. I am surprised that I have reached the age that I have, but fully intend to make the most of it. Bon appetit. All my life I have been sensible with money. I’ve had to be. Some of the early life and study choices that I made meant that I had to live at times on a very meagre salary. With frugal living patterns, I managed to buy my first house at 22, and that of course meant that my income was even more tightly controlled. There was little or no disposable income and so the overseas holidays, concerts and discretionary expenditure that my friends indulged in were beyond my means. Getting a private pilot’s licence also gobbled up a lot of money in my early twenties. It’s taken a long time, but finally I have a reasonable salary. My son is semi-independent and and I can see my life taking new directions. I have been making plans for all the travel that I would like to do now. Just as this happens though, my company hits a rocky period and we know that there are redundancies coming up. We just don’t know who. Should I be one of those who draws the short straw, I will be in a precarious situation. At my age and in the current abysmal employment market, my chances of getting a comparable job again are slim. Even prospects of any job are slim. Sadly, I don’t have the financial resources with which to take an early retirement. Interesting times ahead. The challenge for me now is maintaining an enforced frugality in the face of uncertainly. On the one hand, it is not difficult in that I have the skills developed over a lifetime. On the other, I really want to lash out on the bucket list. I would love to commission myself a new nose, I lust after a pink Argyle diamond and most of all I want to travel. I would like to do a Motor home trip around Tasmania, and then to do the same for New Zealand. That is for starters. I would also of course like the luxury of the time to write – being able to finance my literary aspirations. At the moment, I don’t dare do any of it as I have no idea how long my resources may have to last. If I lose my job, I may have the time to write but I will probably be too busy scrabbling for employment to be able to relax into it. After an initial panic, I will repeat my mantra to myself. The sun will come up tomorrow; I will have food to eat, clothes to wear and somewhere to live. Anything else is a bonus. I have lived through tough times before and no doubt will again. It would be nice sometimes though if there were not so many potholes on the journey through life. Oh, and sometimes I am not so good on the frugality. Today I took delivery of my Canon 650D SLR Camera. I am so looking forward to learning how to use it and of course intend to use it to illustrate some of my writings. It looks to be a brilliant camera.